Light Up UCF At the CFE Arena - Who Said Nothing in Life is Free? Central Florida’s ultimate winter wonderland returns for its eleventh annual season at CFE Arena! We’re spreading holiday cheer at CFE Arena and the University of Central Florida with the annual holiday festival, Light Up UCF. 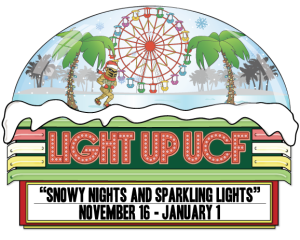 Produced by UCF Convocation Corporation and Spectra, managers of CFE Arena, Light Up UCF will open tonight, Friday, November 16 and run through Tuesday, January 1. This year’s festival offers 47 nights of ice skating, a world-class choreographed light show sponsored by Duke Energy, featuring new music, free holiday movies, live entertainment, rides like the Ferris Wheel and Light Up Express kids train, and much more. Also enjoy the movie “Elf” at 7:00pm and 9:30pm on Friday November 16th.